Well it happened guys. 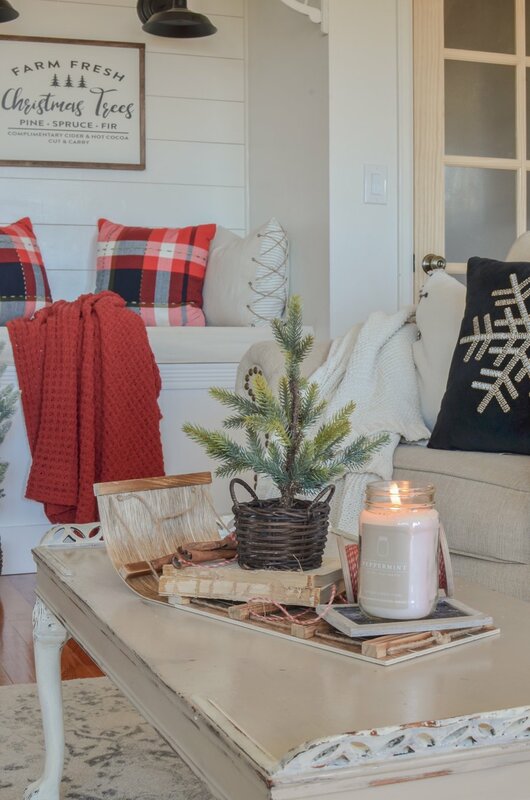 This weekend I got the itch to start decorating for Christmas and I decided to just roll with it even though I planned to wait until after Thanksgiving. But I figured a few days early wouldn’t matter, right?! Right. So on Friday afternoon I started pulling bins out of storage and the kids were SO excited. They’re finally getting old enough to really help, so I let them be my little design assistants for the weekend and it was so much fun. My son actually came up with one of the ideas I’m sharing in today’s post and I think you all are really going to like it! So grab your coffee or a snack and let’s hop to it. Last year my Christmas decor was very neutral. I just wasn’t feeling a lot of red or green, so everything was white and flocked. And even though I loved it, this year I was feeling like a little more color. So I added pops of red with a few touches of black too. And I LOVE it. I think the color just brings this room to life. When I saw these black snowflake pillows last week I had to snag them. Aren’t they so pretty? I don’t know what it is about black decor lately, but I’m just so drawn to it. And I really love how it looks with the neutral background. 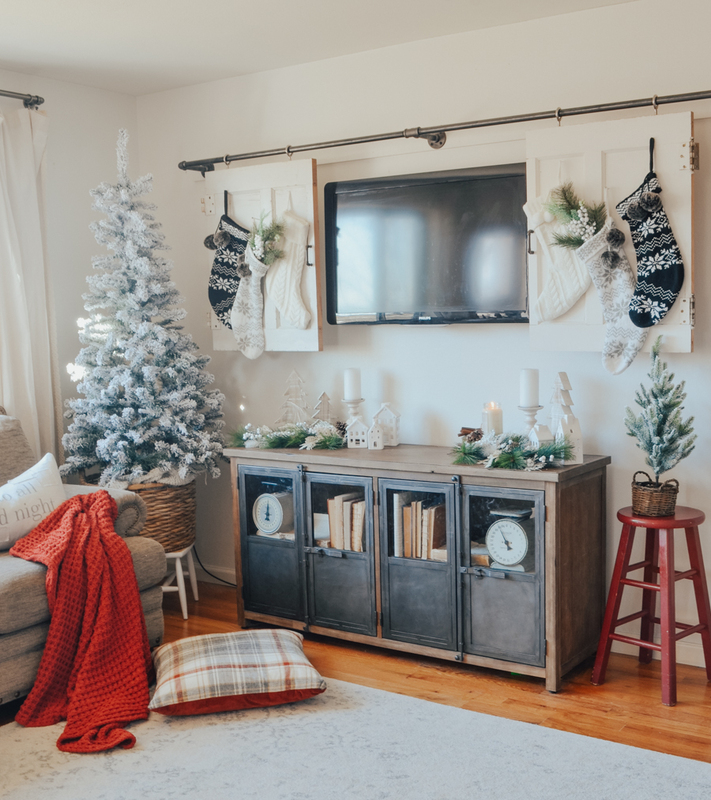 So my son and I were trying to decide how to style these barn door TV covers and he actually suggested hanging our stockings on them. What a great idea, right?! 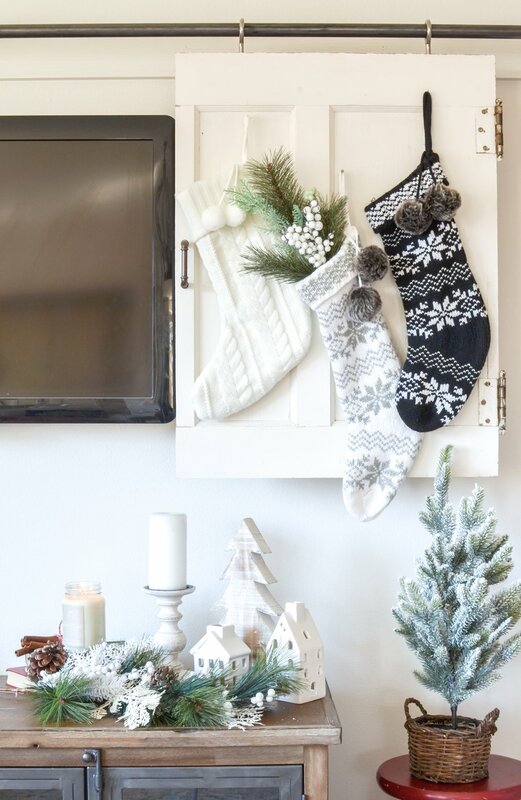 I was all about it, so we layered these three stocking and I love how it turned out. I think it’s such a fun way to display these stockings. Can we just talk about this little wooden toboggan for a second?! I got it from the Target dollar spot a few days ago and I think it makes the perfect little tray for a few Christmas goodies. I styled it with a couple of old books, a spool of red twine, a small tree, and a Peppermint candle that smells like Christmas heaven. 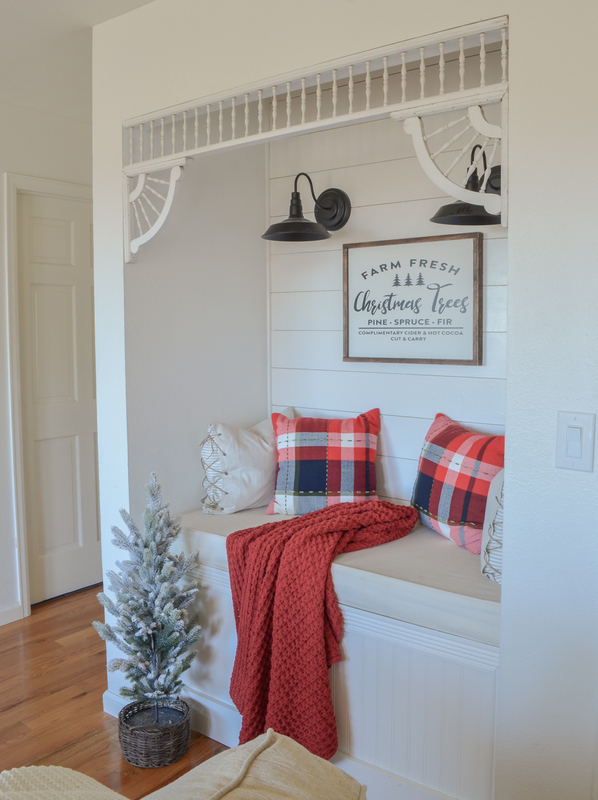 I love this little vignette! Sooooo cute! 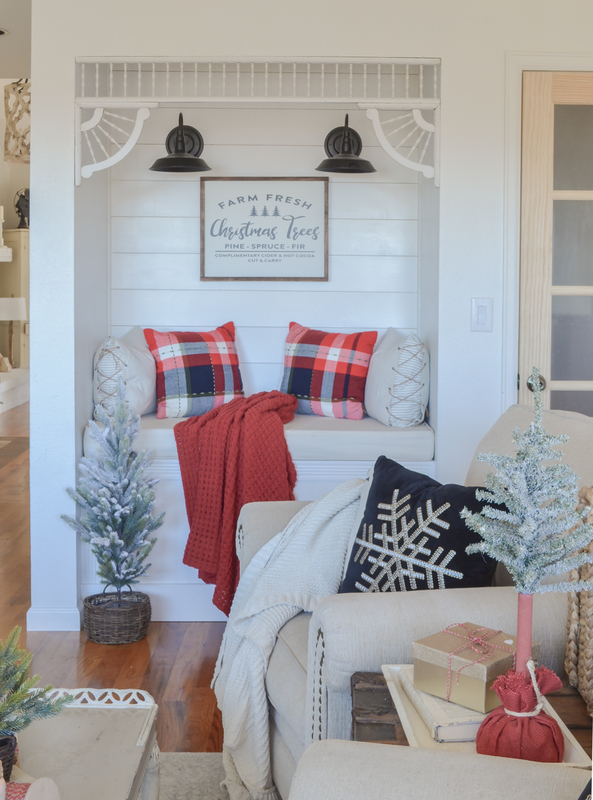 Love the touches of red and black! I’m ready to get started at my house this week!! Tell your son his idea with the stockings is perfect! 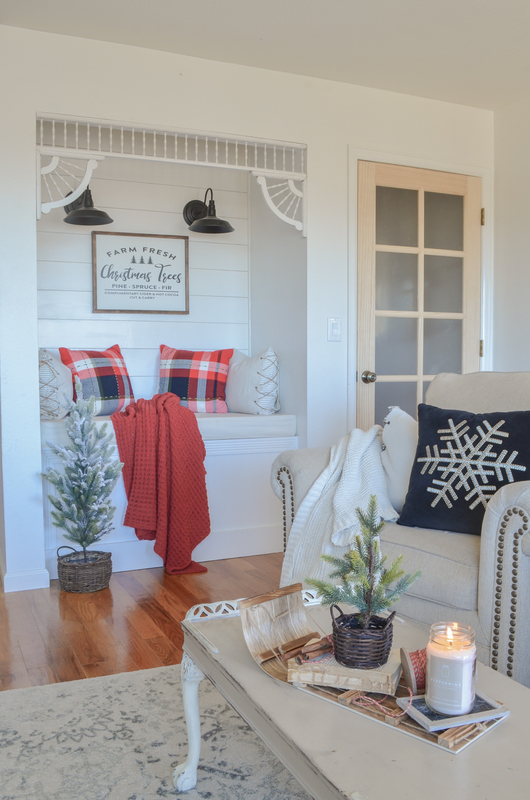 Looks awesome, warm & cozy! I started on my decorating also and glad I did. It’s been cold & snowy and it just felt time! That’s awesome Jan!! Once it starts sowing this time of year it’s so easy to get the Christmas decor out. 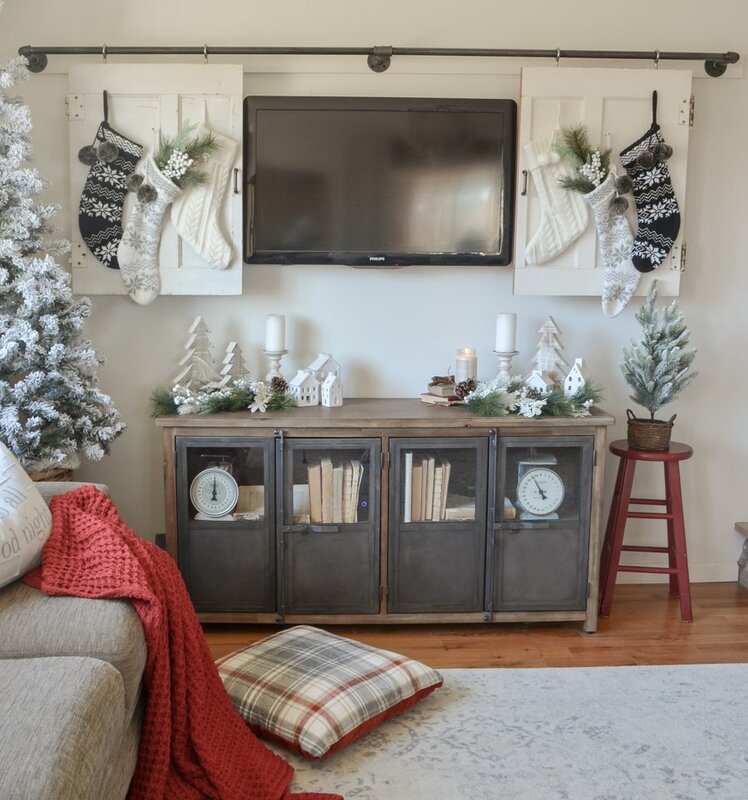 Hi Sarah, Love the look this year of your living room, and hanging the stockings on the doors, great job Owen!!!! But I have to ask, where did you buy the little white houses on your tv table? I love them and have the perfect spot for them on my mantle. Hi Tammy! Those little white houses are all from Target. Some last year and some this year. Looks great! Guess I need to get stated on ours, that’s next week! 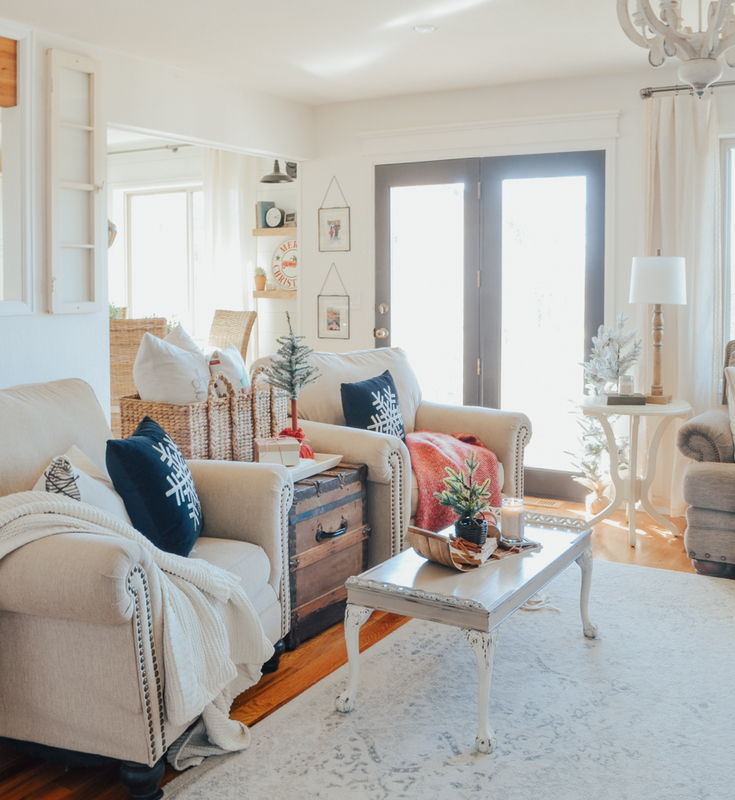 I love the wonderful neutral rug that you have in that room, would you please share where you got it? Thank you and Happy Thanksgiving! Absolutely love the pops of red and black! 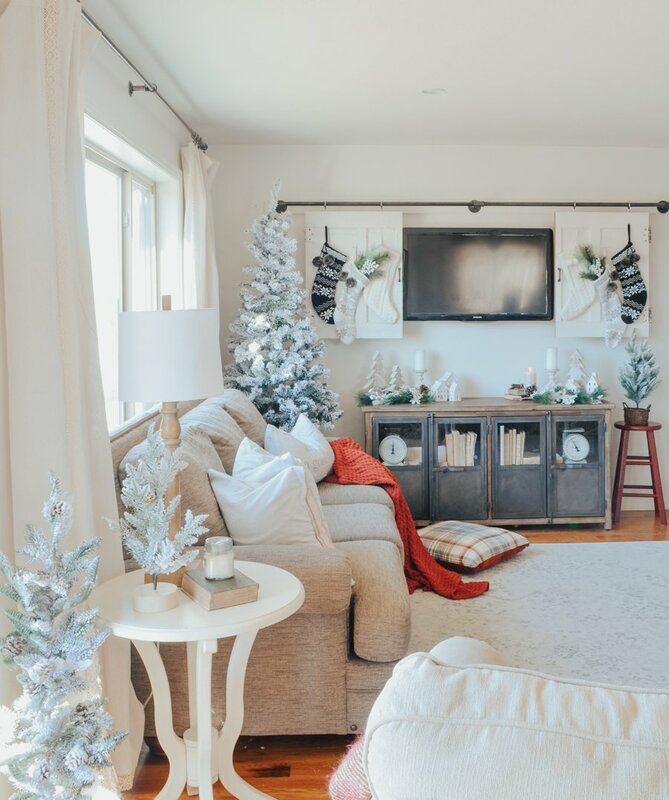 I plan to start decorating Friday and you have inspired me! yay!! 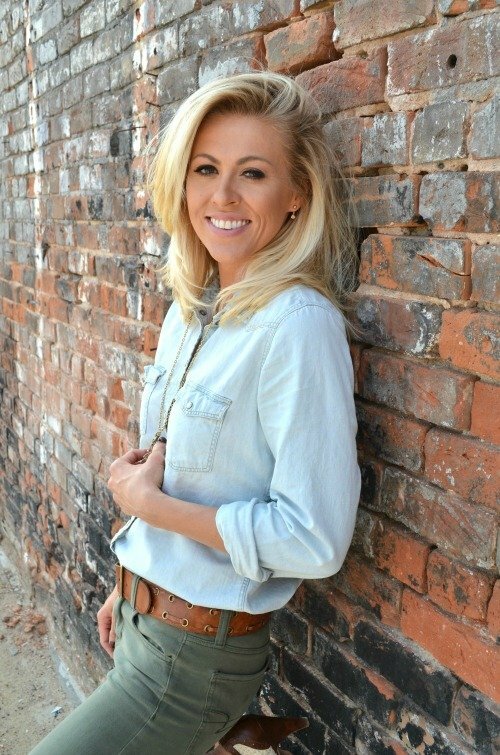 Have fun with it Brittany! 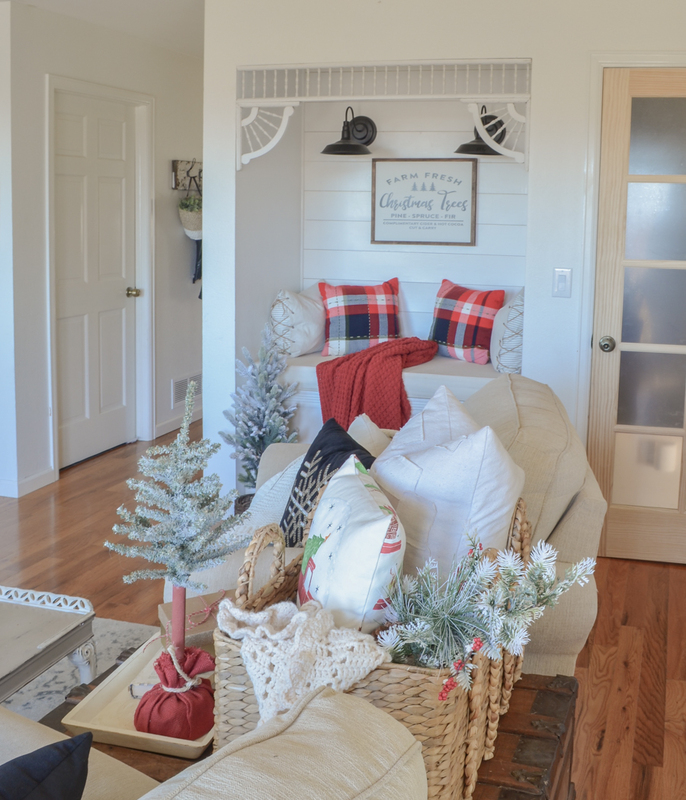 I love how everything is Christmas white in your living room. It’s so beautiful!!! Makes me want to decorate. How’s Ava doing with it all? I have a feeling Ruby will be into everything. haha not very well. I definitely had to move the cute toboggan. She was all about that! haha it really does sound Christmas-y! Thanks for stoping by Becky, I always appreciate it. I love all of this!! The pops of red are perfect. I’ve been trying to decide if I want to go all neutral this year or add color. Your living room is wonderful! thank you so much Alyssa, I am really loving the red this year. oh definitely!! I wish I could do that more often Marie. For me Christmas is lots of red and Green so I like your pops of color. I think maybe your son has inherited your creative genes. He must have been so proud when you went with his suggestion. Good job mom. haha yes he was so proud!! And I loved seeing him proud of his idea. It was so fun! Thank you Deedra, I am really loving the red and black this Christmas! That’s ok Mary, tradition is great too! Everything is so beautiful. 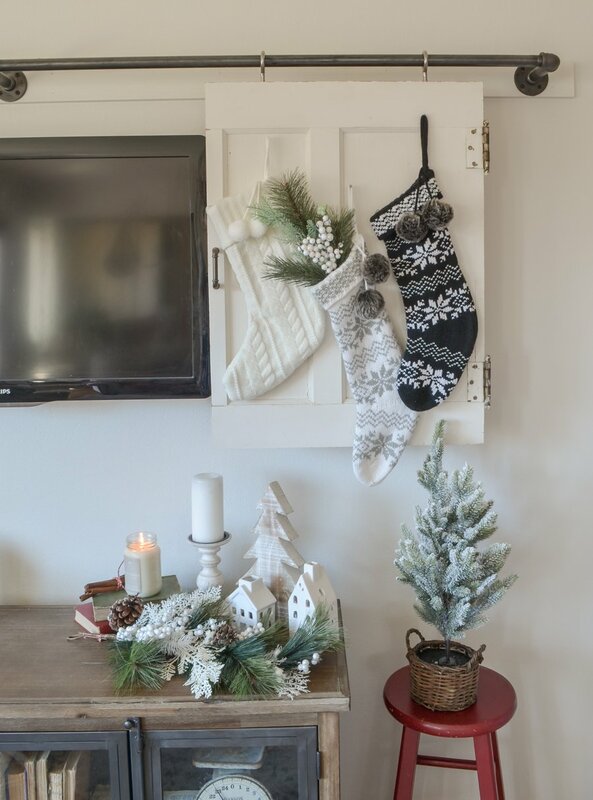 I th8 k that your son may be a chip-off-th old block in decorating…lol great idea to put the stockings on the barn doors. Also I love the sleigh on your table. Thanks Candy, I think he had a great idea too! Everything looks so Christmasy. Love it all. Oh Gayle, I would trade you!! What a dream it must be to live in Australia. It’s on my bucket list–hopefully one day I can visit!! Hey Sarah! Your son had the best idea! I love the way the stockings turned out! Did you change the base of the flocked tree to get it to fit in the basket? I bought a large basket but the base is still too large and was wondering how you got yours to work. For that one in the corner? I did have to stuff a bunch of stuff in that basket to get the tree to stand up straight. It def wouldn’t fit in with the legs! I have looked over this post at least three times as I didn’t want to miss anything!! 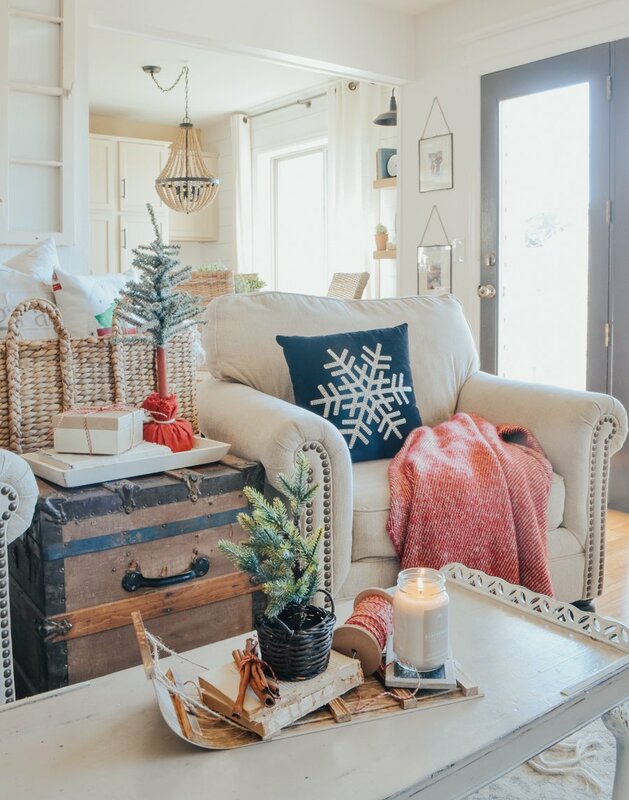 Today is the perfect day to get out the Christmas decor as it is snowing which gets me in the mood. Love your pops of color this year. 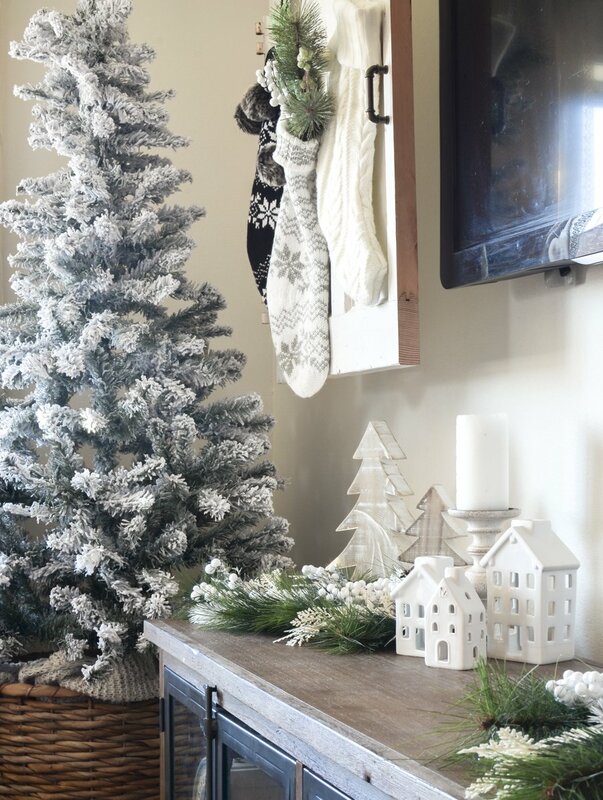 Snow flocked trees, snowflake pillows, stockings, love it all!! Thanks so much Dot!! Hope you had fun getting out your Christmas decor. Thanks Melody, I am loving the black too this year! The wall lights in your reading nook, where might I find them and are the hard wired or battery powered. I need the battery powered. Thanks so much. Looks awesome 🙂 love your style. Where is that amazing “TV console” from?!? Yes! I would also love to know about the console! LOVE IT! !